If you head over to the Dreamspinner page for The Demon Catcher you will see that there is already one excerpt up, from the beginning of the novella. But right here, exclusively for the readers of this blog, is ANOTHER EXCERPT. I chose this excerpt, from about 1/3 of the way through the novella, for two reasons. Firstly, it’s an exciting scene set just before a very crucial turning point for Euan’s character — things are never going to be the same for him again. Secondly, this is the first scene that I wrote for this novella — so it’s special to me, and I’m glad to be able to share it with you. WHEN Euan emerged from his cell, Leon was waiting for him. They stepped out of the building that housed the monks’ cells, and the first rays of sun creeping over the horizon told Euan that it would be a rare clear day. “Almost makes me regret spending today underground,” Leon commented. “Well, at least underground, I’ll be in good company.” He grinned at Euan, and Euan found himself returning the expression. Although the direct passage between the scriptorium and the old chapel was relatively short, a series of other tunnels branched off from the main one, and it was one of these that Leon chose once they were underground. Euan recognized it as a passageway that led to the cliffs by the sea. About halfway along the tunnel—when the roar of the sea crashing against the cliffs was becoming audible—Leon told him to stop, and once again they set about their work of copying symbols. As the morning passed, Euan found that he’d grown accustomed to Leon’s presence. Leon’s company certainly made the grim, dull tunnels a better place to work—it had been a long time since Euan had given up hope of finding the smugglers’ treasure that had once made these passages so fascinating to him. He began to enjoy himself as he led Leon through the tunnels, waiting for him to identify yet another point that needed to be marked with symbols—sometimes on the wall, sometimes on the floor, and always indecipherable. And if he still found himself indulging in thoughts that no monk should entertain—well, the Prayer Circle worked well enough, he supposed. Euan was about to suggest that they stop work for their midday meal when a gust of wind rushed past him, bringing the smell of salt and seaweed with it. The moving air whistled as it made its way through the tunnels, and Euan was thankful that he knew the cause of it. It would be easy to imagine the low keening coming from the mouth of a wounded animal—or worse. Leon broke off, whatever he was about to say lost in the midst of a high-pitched shriek that sounded like no wind that Euan had ever heard, and no animal either. “Run!” Leon said, in a tone that made Euan follow the order without question. Another shriek joined the first, and then a third and a fourth and—Euan lost count after that. He ran as quickly as he could, trying not to stumble on the uneven surface of the tunnel. The sounds grew less distant every moment. The screeching seemed to pierce Euan’s eardrums, and he wondered how it was that he could keep moving with that terrible sound filling his head. “We need somewhere to hide,” Leon yelled. His voice was barely audible over all the noise, but it was enough—enough to remind Euan that he couldn’t fall apart, not now. “I know a place,” he shouted, although he couldn’t tell if Leon had heard him. Finding a place of safety, Leon’s presence beside him—Euan tried to focus on those things as his breath grew short and the unholy screeching drew closer. Euan thought he might have missed their refuge if Leon had held his lantern in his left hand instead of his right. The way that the rock jutted out, just so—it looked natural, but Euan knew otherwise. He grabbed Leon by the arm to stop him running, and began to search for the right pattern in the stone. Euan’s fingers fumbled as he sought out the correct place. Behind them, the screeching grew louder, sounds from the very pits of the Damned God—sounds that only minutes ago Euan would have sworn could never be real. He trembled, and suddenly he was aware of a warm hand on his back. Euan nodded, and took a deep breath. He ran his hands across the stone and found the latch hidden behind a carefully concealed groove. 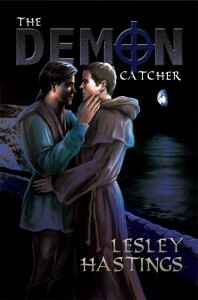 Just one tug, and—Leon wasted no time; as soon as the door opened, he took hold of Euan by the waist and pulled him in. “How do you close this thing?” Leon yelled. “There’s a lever.” Euan reached around Leon and found it, set deeply inside the wall, and the door closed with a loud, low rumble. “Are we safe?” he asked, when it shut completely. They could, at least, hear each other properly in here. “We’ll be fine.” Leon’s voice was confident, but as the sound of the approaching demons grew louder again, Euan struggled to share that feeling. When he heard them just outside, when he knew they were only feet away, he thought he might scream. But then Leon’s hand—still at his waist—squeezed him, assuring him, and all at once they were gone, the terrible screeches disappearing into the distance again. The demons hadn’t taken them. They were safe. Euan felt a moment of relief as the fear left him; he laughed against Leon’s shoulder, leaning into him and then—his laughter came to an abrupt halt, as he found himself filled by a different kind of horror. The hidden chamber was barely large enough for two people. A narrow shelf above their heads had given Leon a place to rest his lantern, which was burning low. It cast just enough light for Euan to discern the outline of Leon’s face, positioned—beautifully, terrifyingly—barely an inch away from his own. Leon’s hand still held him tightly, and he could feel the contours of the other man’s body through his robes. Trying to ignore the blood that was rushing to his groin, Euan closed his eyes and prayed the First Prayer.